Getting rid of debt and living securely is not something that can be easily done. It takes a lot of hard work and dedication. 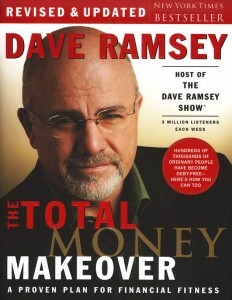 Many of the blog’s readers know what a big fan of Dave Ramsey’s I am. His book, “The Total Money Makeover“, is a must-read for anyone who has a problem with saving or staying out of debt. In fact, it is a must-read for everyone no matter what your station is in life, whether you are rich or poor, in debt or debt free, etc. Ramsey’s book advocates using a simple seven-step plan in order to get out of debt, save for the future, and have the life of your dreams…a life that we all deserve. Taking “Baby Steps”. Have you ever seen the Bill Murray movie “What About Bob“? In the movie, Murray’s character is a mental patient who has trouble with obsessive compulsive disorder (OCD). He has trouble doing the most normal daily tasks, and his psychiatrist recommends that he takes things little by little. He recommends taking baby steps, and Murray’s character constantly reminds himself to take baby steps. Little by little, you can accomplish what seems like the most gargantuan tasks such as getting from behind of a mountain of debt (Ramsey’s specialty). Ramsey tells readers to take “baby steps” in order to free themselves from debt and to follow each step, one at a time, before proceeding on to the next step or phase of the process. It is a plan for building wealth slowly, and just like a diet, only works if you plan to change the way you currently spend and save and alter your behavior. The Total Money Make Over is not an easy plan if you are up to your eyeballs in debt or have other money issues. But, it is a plan that will work over the long term with discipline and sacrifice. It is a book and program (sort of synonymous) that will change your life. For the next seven days, I will be detailing each one of these baby steps in more details. So, please check back or sign up to get all of the posts in this series in your favorite RSS Reader or by E-Mail. But this is awesome advice to just about anyone. We all need to carry less debt. I kind of look at debt like the spare tire hanging around my midsection. It doesn’t look good, it doesn’t feel good, and it definitely isn’t good for me. The sooner you get rid of it, the better off you’ll be.